Today we’re going to look at Asset Classes. Today we’re going to look at the characteristics of the various asset classes and sub-classes themselves and which ones suit which purposes. Many of you will recognise the picture at the top of the post. It’s from a report published each year by Callan Associates called The Periodic Table of Investment Returns. You can get the 2014 version here. The table shows the returns from various types of investment – asset classes – over the twenty years from 1995 to 2014. 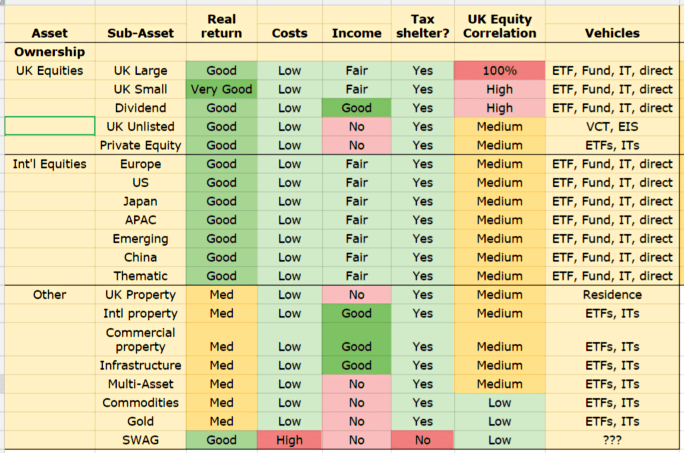 The assets are colour coded and ranked in each column (each year) from highest return to lowest. 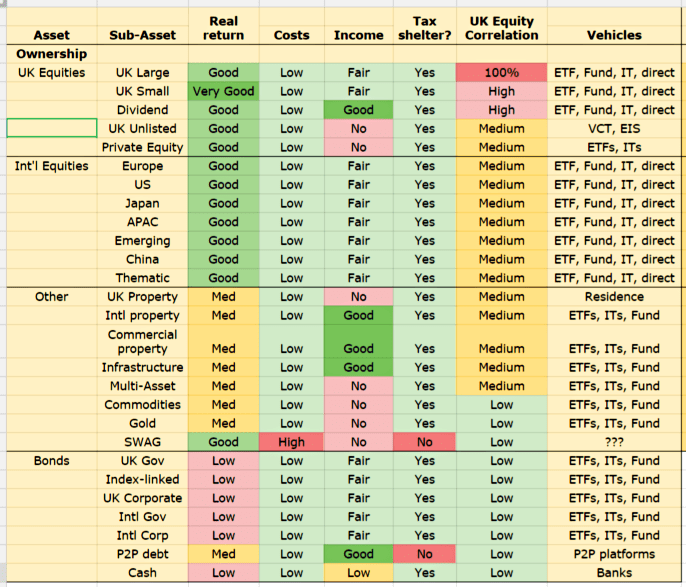 The resulting jumble of colour as the rankings change each year is intended to make the case for diversification across asset classes (stocks, bonds etc), and also across sub-class dimensions such as “factors” (growth vs. value, large cap vs small cap) and geography (in the case of the table, which is US-centric, US vs. non-US). Let’s look at how a UK investor might apply that conclusion in practice. As investors, we’re after returns. The bigger the better. Historically, the best returns have come from equities. We have no way of knowing whether equities will have the best returns in the future – and we can be certain that the future won’t be exactly the same as the past – but the past remains or best guide to the future. Returns from stocks bounce around a lot from year to year. In particular they suffer from larger drawdowns (losses) than other assets. Whether a drawdown is a big problem for you is will depend on your time-horizon. If you don’t need the money right away, you don’t have to sell during the drawdown, and you don’t have to convert your paper losses into real ones. Another way that having a long time horizon helps is that with equities, volatility decreases with time. Whether the market is up or down today is almost a 50/50 bet, but if you can wait 10 years, you’re almost certain to be ahead. Because of this, the best way to approach investing is to view it as a life-long quest for financial independence. You need to accumulate enough funds so that you can reasonably draw from your pot each year to fund living expenses, without undue risk that you will run out of money. This perspective gives you a 50+ year investment horizon, and lots of temporary issues just disappear. Working out high and low valuations is another matter, but it is important to consider future market conditions when making an investment. For example, bonds are currently in a 30-year bull market and are benefiting from historically low interest rates. When (if?) interest rates rise, returns are likely to fall, so many investors will have a lower exposure to bonds than under more “normal” conditions. To smooth out equity returns, investors diversify across asset classes, expecting that good returns from other assets will offset a bad year for equities. Whether this happens in practice depends on the correlation between the returns of equites and the alternative asset. We’ll look at correlations from a home country equities perspective – how highly are other assets correlated with UK stocks. Correlations were historically quite low and stable, but in recent years they have been increasing. In particular, correlations increase in a crisis, meaning that they don’t offer as much equity drawdown protection as might be expected. This does not mean that a well-diversified portfolio can’t produce higher and less volatile returns than an 100% equities portfolio, in the long-term. Two other considerations when diversifying are liquidity and rebalancing. Cash is the most liquid asset, but in practice, most exchange-listed products (ETFs, investment trusts etc.) have acceptable liquidity. Liquidity is a bigger issue for some real assets, like property, and some forms of lending (such as P2P debt). A diversified portfolio will need regular – say annual – rebalancing back to its original composition in order to make the most of the differing returns of the various asset classes. We’ve already noted that volatility is not risk, even though some famous financial theories and equations treat it as such. Instead, as Warren Buffett says, risk is the potential for a reduction in the investor’s purchasing power. So cash, over the long-term, is a risky asset because it has the potential to underperform inflation. It is not volatile, and – thanks to government guarantees – usually there is no risk of complete loss of capital. Yet it remains risky on one of the three dimensions (volatility, loss, inflation). A fourth aspect of risk is FX risk. We will approach asset allocation from the perspective of a UK investor, who needs to spend money measured in pounds Sterling. So assets measured in other currencies have an additional risk. Over the long-term, FX fluctuations are not likely to be significant, and hedged products are sometimes available, but they are real. For a long time, UK private investors had a simple choice between buying individual stocks, or buying unit trusts (now called OEICs) direct from the fund manager. Investment trusts existed, but few people heard about them because unlike OIECs they didn’t pay financial advisers a commission. Then index-tracker funds came along, and the fund supermarket platforms were created. ETFs were invented and fund commissions were scrapped. The internet led to products like P2P lending and crowd-funded equity. Niche products include P2P, crowd-funding, VCT, EIS, SWAG (stamps, wine, art and gold) and currencies (including crypto-currencies like BitCoin). That concludes our run-through of terminology. So now that we understand the territory, let’s begin to make our map. At the highest level, the split in assets is between ownership (stocks and physical assets) and lending (cash, debt and P2P). We’ll start with UK stocks. Equities will form the bulk of our hypothetical portfolio, and UK equities the largest proportion of that. So we’ll use them as the baseline for our assessments of other assets – we’ll evaluate their properties relative to those of UK stocks. Mainstream UK stocks should produce good real returns over the long-term (subject to the caveat about valuation, above) but will be volatile. Apart from the volatility risk, they score well on the risk of loss, should cope with inflation, and have no FX risk. So overall they get a medium score for risk. I should point out at this stage that equities regularly go down by a significant amount – 20% or more in a single year. Less regularly – perhaps once or twice in an investing lifetime – they may go down by 40% or 50%. So with 35% to 50% of your net worth in equities, you’re looking at regular drawdowns of 7% to 20%, and occasional falls of 14% to 25%. If this is something you can’t countenance, you might have to dial back your equity allocation. But we have forgotten about international equities. This is basically just a geographical variation on UK equities. The UK stock market makes up only 7% of the global market. As you would expect the US dominates. We can also add “thematic” investing here, for example technology or biotechnology. International equities share most of the characteristics of UK equities, but have lower correlations to the UK market. In exchange for this they add FX risk. 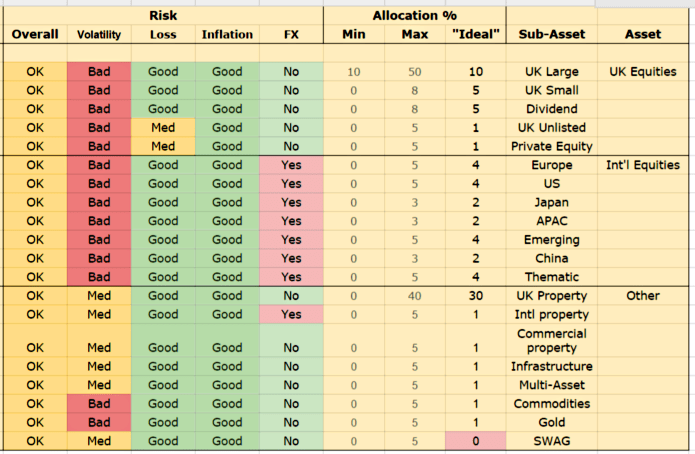 I’ve gone for a simple 50/50 split between UK and international stocks, and adjusted the allocation percentages accordingly. For most UK investors, the most significant asset class after equities is property. For this reason I believe that most UK investors targeting financial independence will own a property. Using round numbers, the average UK property is approaching £300K and the average pot needed for FI (including this house) will be around £1M, so we can use 30% as the average property allocation. The good news is that property prices are not that closely correlated to UK stock prices, so this won’t destroy your portfolio. If you want more exposure, trusts featuring UK commercial property, and international property are available. Infrastructure fund and commodities – and the multi-asset funds that combine the two – can be useful diversifiers as a small proportion of a portfolio.2 The question is whether the small benefit is worth the effort. Each investor must answer for themselves, but they are likely to be more relevant to larger rather than smaller portfolios. SWAG has shown excellent returns in recent years, and for some types of SWAG, over the long run. The problem for private investor is accessing these assets at a reasonable cost. (See my article on stamps for more detail). For this reason it is not included in the portfolio. We’ve now allocated 80% of our portfolio, which leaves 20% to spread across the lending assets – cash, bonds and P2P lending. These are unusual times for bonds – record prices at the end of 30-year bull market, record low yields because of record low interest rates – but we’ll ignore this for the purposes of setting a default allocation. Let’s start with cash. It’s very safe – guaranteed up to £75K per bank account – but has low returns. We need an emergency fund of six months’ living expenses. For the typical UK investor reaching financial independence, this could be as little as 1-2% of net worth. Most people will feel more comfortable with more cash than this, so let’s say 5%. P2P lending is sold as a sexier version of a bank account, with higher returns in exchange for tying your money up for a while. But there’s no government guarantee if the people you are lending to can’t or won’t pay up, and the system hasn’t been tested through a complete credit cycle. It’s also the case that the lending rules have been relaxed as the sector has grown. Finally, P2P is currently not eligible for tax shelters. That leaves 10% to spread across the four types of bond. EIS and crowd-funding are both forms of equity investment in the very smallest and riskiest of companies. EIS is tax advantaged and crowd-funding is not. I think that both of these products are too risky for the average private investor. Most of the upside from these investments can be achieved through less risky products such as Private Equity funds, VCTs and AIM stocks. Currencies are a zero-sum game in the long run, and best left to those with day-trading aspirations. There isn’t space in a single article like this to cover all types of asset in great detail. 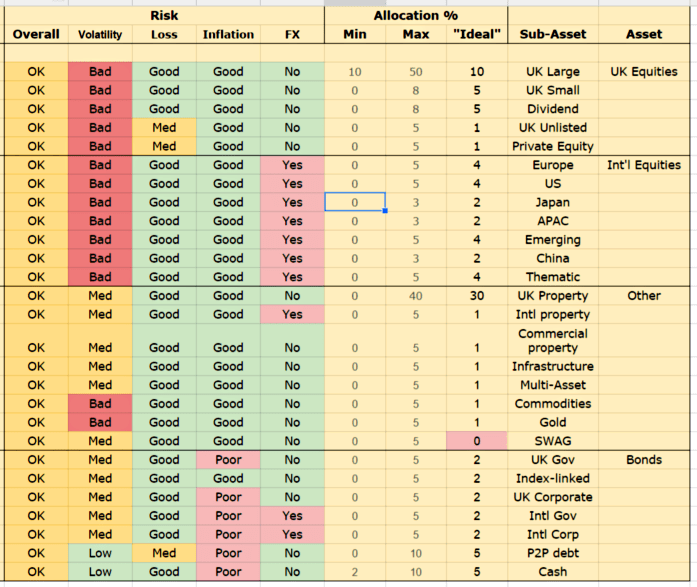 What I’ve tried to do is look at the main characteristics of each class, and examine how a UK investor might use them to construct a portfolio for the long-term. Allocation percentages are just suggestions, and everyone will choose their own numbers. Let me know about yours, especially if they are significantly different to mine. And if you think I’ve made a big mistake, or forgotten about something, tell me in the comments. Great article Mike. For investors starting out with a small pot of less than £5k or those investing for children with say a £1K starting point I recently read an article in the FT Money section suggesting a Global Tracking fund or ETF would be a good start in order to maximise the spread of assets whilst keeping costs down. Would you agree with this approach? What sort of size pot would you need to start implementing the above? I think with £1K you should definitely be looking at something like a global tracker. A fully diversified portfolio would need anything from half a dozen to 50 underlying investments, so the size of pot needed is in the £10K to £100K range. I like to think of it as a spiral – you start in the centre with the plain vanilla stuff, and as you keep adding money to your retirement pot through the years, you move on to more exotic stuff. Since you invested there earlier, you should end up with more cash in the core areas by the time you get to retirement. Very helpful summary and table, thanks.